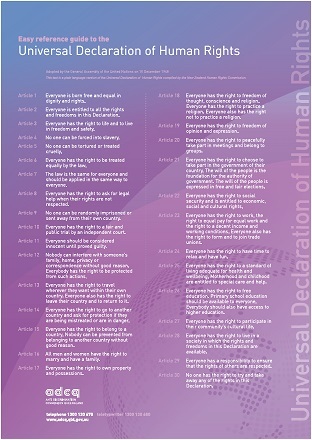 An easy reference guide to the Universal Declaration of Human Rights is available from the Commission as a poster. Download text of the Easy Reference guide to the Universal Declaration (File, 47.2 KB) . The text is a plain language version of the Declaration, and was compiled by the New Zealand Human Rights Commission.